21 CFR 117 is must reading, not only for food safety but production efficiency and a tighter supply chain. The Bible is a mashup of two testaments that aren’t always in sync. While one speaks of vengeance (“eye for eye,” Leviticus 24:18), the other talks of forgiveness (“turn to them the other cheek,” Matthew 5:39). Confusion is inevitable. The bible of food processing can be found in Title 21 of the Code of Federal Regulations. For years, conscientious processors turned to part 110 for guidance on good manufacturing practices. 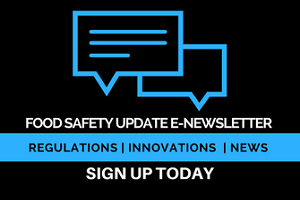 The essential rules of the Food Safety Modernization Act (FSMA) trump part 110 and replace it with part 117. For food manufacturers, the message is clear: There’s a new gospel, baby, and it’s time to ditch the old one. Maybe they’ve turned away from the church of the federal code, or perhaps they’re too orthodox to let go of part 110, but many (probably most) food professionals have yet to read the revised code. In a recent on-line survey sponsored by Safety Chain Software and the Acheson Group, 29 percent indicated their companies were considering the new supplier compliance rules, and another 22 percent said they weren’t considering them. Those rules, detailed in subpart G of 117, put the onus on processors to assess, validate and document that the facilities that ship them raw materials and ingredients are in compliance with FSMA. And by source, FDA doesn’t mean Mega Milling Co.; it means the mill from which the flour was made. Merely “considering” auditing that mill or reviewing independent reports of the mill’s compliance places the receiving plant in the crosshairs of inspectors and makes the company a candidate for the exemplary shutdowns that will occur later this year and in 2017. Foreign supplier verification received a lot of attention in the run-up to final FSMA rules, but the innocuously named current good manufacturing practices (cGMP) make clear the same if not more rigor is expected in analysis of domestic suppliers. Sorry, no mulligans granted for purchases on the spot market. Fundamental change, not more paperwork and good intentions, is the essence of FSMA. “Raw materials are one of the biggest areas where there will be issues,” asserts Robert Rogers, senior advisor-food safety & regulation for Mettler-Toledo’s product inspection group, Tampa, Fla. Because the rules are deliberately nonprescriptive, food companies need to understand the spirit of the law and then devise a plan for compliance. To illustrate, Rogers cites the regulations specific to package labels. Mislabeled products are the leading cause of recalls, particularly when undeclared allergens are involved. The labeling process is specifically identified as an element of the hazard evaluation that processors must conduct. Human error often is the cause of mislabeling, but a simple “oops” won’t suffice as a response; process changes to prevent a repeat are required. When Nestle/Dreyer’s Ice Cream added lines to its Bakersfield, Calif., plant in 2005, undeclared allergens already were a concern, so the firm commissioned Huhtamaki to incorporate a 2D reader that would scan every carton flat entering a forming machine to ensure the carton code matched the ice cream being filled. Today, off-the-shelf vision systems are available on form/fill/seal machines like those from TNA North America — but as an option, not a standard component. Inspection technology is a good starting point for in-plant improvements. The greater need is improvement throughout the supply chain, however. “Raw materials are one of the biggest areas where there are issues,” Rogers points out. He characterizes FSMA as a first step toward the supply-chain controls that have existed for years in pharmaceutical manufacture and distribution. Item-level coding and documentation for drugs are geared toward anti-counterfeiting efforts, though there also is a safety overtone. “The food and beverage industry is foolish to think that pharmaceutical tracking of where raw materials come from isn’t going to be a requirement in the very near future,” he believes. Electronic records were a prerequisite to pharma’s supply chain control. In the wake of the Bioterrorism Act of 2002, the expectation was that food traceability requirements would spur conversion to e-records. It didn’t happen, but technology providers believe FSMA will drive the conversion anti-terrorism could not. Unfortunately, technology does not yet exist to resolve the supply-chain traceability challenge — although vendors are focused on devising a workable solution. Compared to pharmaceutical, the food chain is the Wild West, with no standardized terms and hundreds of thousands of processors and suppliers. Additionally, the information that companies need doesn’t reside in a single system. Instead, bits and pieces can be found in ERP, MES and track & trace software, points out Brandon Henning, director-industry solutions at Sparta Systems, Hamilton, N.J. The answer is “hub technology” that integrates “predefined integration touch points” — essentially standardized fields for the separate programs. Absent industry standards, technology providers are creating their own, though only for a closed loop of programs. Major brand owners are “under more scrutiny and are more afraid that regulators are going to make an example of someone for failure to comply -- and they don’t want it to be them,” says Henning. Most of the industry’s biggest companies use SAP’s ERP system, with programs from Wonderware, Rockwell and a smattering of other vendors dominating the manufacturing space. By mapping data points in those systems to Sparta’s “enterprise quality management system,” the firm hopes to present large manufacturers with the closed-loop integration they need. “The 80/20 rule applies,” Henning adds. The hub technology won’t support more than a handful of ERP and MES systems, but major processors account for the majority of technology spending and are more likely to have the multiple data-collection systems needed to drive the integration hub. Supply chain oversight also is a priority in China, particularly for infant formula. The effects of the 2008 melamine contamination of baby formula continue to reverberate in China, where parents still avoid domestically produced baby formula. Three-quarters of the formula producers pre-scandal went out of business. To rebuild trust, the Chinese government instituted safeguards that mirror the process and traceability requirements of FSMA. Beingmate, in partnership with Fonterra, recently built China’s largest infant formula plant in Hangzhou, with annual capacity of 50,000 tons. Rockwell’s MES package is an element in the company’s supply chain system. The software helps Beingmate meet traceability requirements, says Rao, but it also boosted productivity 3 percent and is credited with reducing labor costs 7 percent through automated data collection and material error proofing. U.S. food companies have been spared a scandal of melamine’s scope, although the Peanut Corp. of America salmonella poisonings soon after came close. Hundreds of PCA customers were forced to recall thousands of products, at a collective cost exceeding $2 billion. To a large extent, PCA galvanized support for FSMA among major corporations like Kellogg, whose CEO estimated recall losses at $70 million, excluding damage to the brand. PCA dramatized the interdependence of food companies and their suppliers and the fragility of consumer trust. It’s also why FSMA doesn’t stop at processes within a production facility but rather extends throughout the supply chain. For food processors who want to ensure their organizations’ long-term sustainability, salvation starts by familiarizing themselves with the details of 21 CFR part 117. Part 110 is like the 18th Amendment: It’s still on the books, but the 21st Amendment is the law of the land. So pour a stiff drink and curl up with all 399 pages of 117 this Sunday. It’s the food industry’s new gospel. Exploring the first step in preparing a facility’s food safety plan: the hazard analysis.